How white is your white gold? Style, fashion, beauty all reasons to choose white gold. White gold compliments diamonds. White gold is bright. White gold has a pure reflexive look. White gold is white…or is it? White gold can be illustrated with gasoline. There are generally three grades of gasoline, regular (really the lowest) mid grade, and premium. In addition, not all gas is created equally. We have all had the experience of poor performance due to poorly made gas. White gold also has three grades. Grade 3 is off white, grade 2 standard, grade 1 is premium. This means when white gold is made, it can be yellowish to light yellow. Exaggerated example of plated gold. When white gold rings are new they are coated with a white metal called rhodium. Rhodium is a metal very similar to platinum and rhodium shares many of the properties of platinum including its white color. The rhodium plating is used to make the white gold look whiter. The natural color of the white gold could actually be a light yellow color. The rhodium is very white and very hard, but it does wear away eventually. For years I have been telling my clients about the problem with no real solution…now we have a solution! 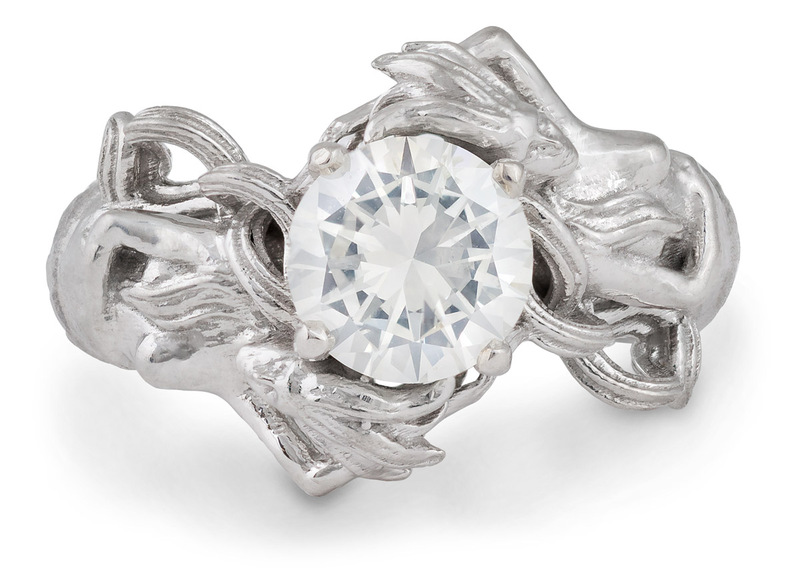 Why are white gold consumers dissatisfied? Because they don’t know what the true color of the jewelry is when they buy it. I have seen a yellow gold ring heavily plated to look white. This was a true 14 karat yellow gold made to look white and it worked for a while. What the white gold task force did is come up with the three grade levels of white gold. Nice. But that is not the real problem. How can you tell what the jewelry looks like under the plating? Over the years the stories some jewelers tell their customers about the yellowing of their jewelry are amazing. They say the gold is working its way up to the top. The white gold wears out to a yellow look. Or the one I dislike the most is, you made it look yellow. Your body chemistry made the jewelry turn yellow. I know most jewelry sales people only see white gold with the plating on it and assume that is its true color. Most of them don’t know that jewelry manufacturers choose the white gold alloy mix. 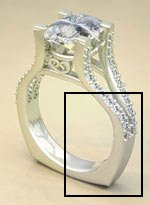 It is much cheaper to use the standard white gold alloy (again standard is the lowest) then a more white looking alloy. Most jewelry sales people don’t wish to seem uninformed so they pass on what they hear, or feel what the right answer is. After all, the customer just trusted them with a sizable purchase, they must know or lose the trust. This grade includes alloys measuring less than 19 on the ASTM Yellowness Index, and does not require rhodium plating. This grade includes alloys measuring between 19 and 24.5 on the Yellowness Index. Rhodium plating is optional. Grade 3: Poor white (incomplete bleaching). This grade includes alloys measuring 24.5 to 32 on the Yellowness Index, which do require rhodium plating. Any alloy measuring above 32 on the Yellowness Index falls outside the “white gold” definition. Now don’t think after learning the diamond’s four C’s you must learn the white gold grading chart. It won’t help learning the chart unless you have x-ray eyes. You can’t see through the rhodium plating. For years I have been telling my clients about the problem with no real solution. I have an article on white gold versus platinum you can read that explains the issues. But now we have a solution! We have found a gold alloy that is extremely white and looks great without any plating. Star White Gold is bright and white without any plating. You see what you get. No guess work. No taking anyone’s word about how white it truly is. Star White gold has a bright shinny hard finish that will keep its look. While regular white gold yellows with time, Star White Gold stays white. Our manufacturer of the Star White alloy has tested it and states: “Star white gold has been developed with the consumer in mind since some people who enjoy the high fashion look of white may have sensitivity to the nickel in white gold. Star white gold has been evaluated by a leading independent testing laboratory. With Star White gold, the bright white color you see is the color you get. The rich reflective surface makes for a gorgeous piece of jewelry, and the clean white gold shows off diamonds to their fullest brilliance. Pure Star White gold enhances so many jewelry designs. When you buy a piece of quality jewelry you want it to last for decades. That is one of the reasons so many people are disappointed with traditional white gold. After a few months of wear, it turns light yellow and loses the pure white look. Star white gold will keep its purity for generations. The clean bright look you bought the jewelry for will be permanent, not just a thin plate. Arden Jewelers’ Star White gold keeps the promise of white gold. The bright clean style of Star White gold will enhance the look of diamonds and gemstones. 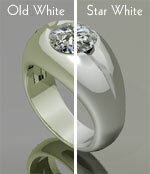 Star White jewelry will last a very long time with a clean pure white gold look. Your prestigious White jewelry will keeps its beauty and enjoyment for a life time. Impressive and treasured jewelry with Star White gold is Arden Jewelers’ vision. Feel free to come by any time to learn more about Star White Gold and to see examples of Star White gold in person. Or, you can check out the products we have for sale online that are made with Start White gold below. My husband’s skin on his finger actually peels underneath his ring. Is this normally a sizing problem (inability for the skin to breathe, maybe?) or could it be an allergic reaction? We’ve been married 11 years and the problem started only a couple of years ago. Hi Anne, thanks for commenting, and I’m sorry to hear about your husband’s ring. That sounds more like an allergic reaction to me, but it is strange that it would just being showing up recently after so long. We have put together an article on what to do when rings irritate your skin. You might want to give that a read to see if it sheds any light on your situation. Beyond that, it might be worth talking with a dermatologist to see if they can pin-point the exact cause of the problem. Hi, I’m Krystal. Is my assumption correct in stating that Grade 1 white is the same as star white gold? Also, is Arden Jewelers the only source of star white gold at this point? I live in Trinidad of Trinidad and Tobago, WI. Thanks. Hi Krystal, thanks for asking. Yes, our Star White gold alloy is a Grade 1 white gold, and yes, Arden Jewelers is currently the only place where you can buy Star White gold jewelry. That said, Star White is not the only Grade 1 white gold alloy out there. If you are shopping around, be sure to ask if the white gold you are considering buying will require regular plating to stay white or not. Hopefully that helps, and please feel free to contact us if you have any additional questions or if you would like to get started on your own custom Star White gold creation. So there is not much I can do about my ‘yellow’ white gold ring that does not stay white. Can I do something at home instead of sending it off to have it whitened? Hi Eva, the ‘yellow’ you are seeing is a result of the gold alloy that was used to make the ring, so unfortunately, there is nothing that can be done to change that. 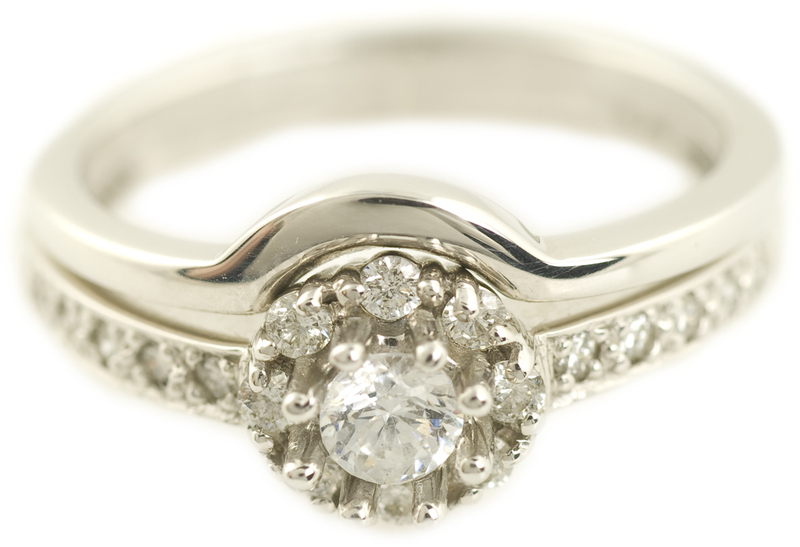 We can always use your existing ring as credit to offset the cost of a new Star White Gold ring. Feel free to contact us, if that’s something you would be interested in.